The launch vehicle for Arianespace’s second Soyuz flight of 2019 is now complete following integration of its “upper composite” – containing the next four satellites to join SES’ O3b constellation, which delivers low-latency, fiber-like connectivity around the world. 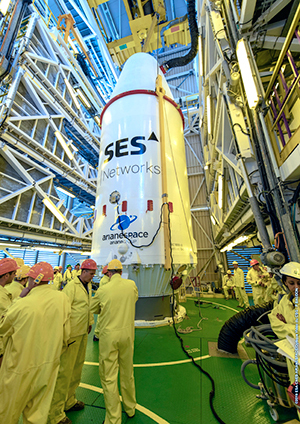 Flight VS22’s upper composite is shown after its installation atop the Soyuz launcher in the mobile gantry. This activity occurred at the Spaceport in French Guiana, beginning with the workhorse launcher’s rollout from its MIK integration hall to the launch zone. Using procedures that date back to the origins of the space age, the Russian-built Soyuz was transferred horizontally, followed by its erection on the launch pad. Once this action was completed, the upper composite was hoisted in the ELS launch zone’s purpose-built mobile gantry – which provides a protected environment for the vertical installation atop Soyuz. Designated Flight VS22 in Arianespace’s numbering system, the Soyuz mission will begin with a liftoff at exactly 1:30:37 PM local time in French Guiana on April 4. The four O3b passengers on board will be deployed into a circular orbit during a mission lasting 2 hours and 22 minutes. The O3b fleet of medium-Earth orbit (MEO) satellites – operational since 2014 – is a proven non-geostationary constellation that provides commercial broadband services today, delivering carrier-grade services. The first 16 spacecraft for O3b were successfully orbited by four Soyuz vehicles operating from the Guiana Space Center in 2013, 2014 and 2018. Each satellite weighs about 700 kg. at launch and provides more than 10 Gbps of capacity. Larger versions of the photos above are available in the Gallery. on Apr. 4 12:30:37 p.m.
on Apr. 4 6:30:37 p.m.
on Apr. 4 1:30:37 a.m.